When children topple off a bike, helmets can save their brains — cutting the risk of head injury by 80%. But some helmeted children still get brain damage. Why? One study has found that those who wear helmets that don’t fit well are nearly twice as likely to have head injuries! The biggest risk comes if the helmet is too big (especially too wide) or if the helmet is worn tilted back on the head (Injury Prevention 1999;5:194-197). An inch wider than the head is much too wide! 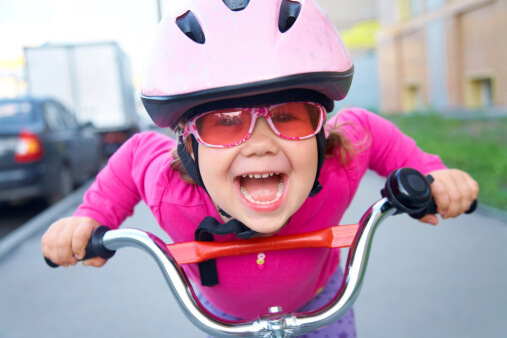 Parents and children alike need to wear a helmet every time they ride. But to get the full benefit, the helmet must be the right size and worn in the correct position. Don’t ride with a false sense of security.